Booo fans of other teams! Booo states that are home to other teams! Wait, does that mean boo Pennsylvania, because it’s also home to the Pirates? But only the western half! Booo Raymond, the inferior mascot! As a matter of fact, booo all mascots who aren’t the Phanatic! Booo all beer that isn’t Yuengling! 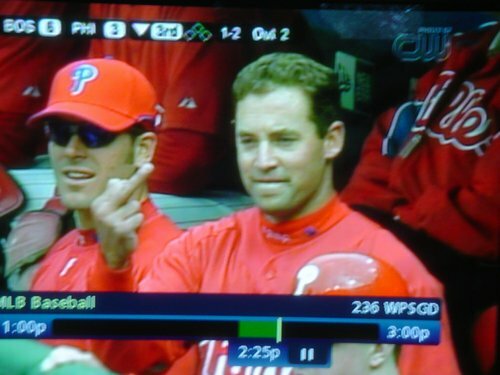 Booo any girl who’s ever said ‘no’ to Pat Burrell! Just kidding, that’s never happened! Booo vomiting in the huddle! Booo 25 years of self-loathing and self-pity! I think you just booed Arizona. I’ll take Arizona off the booo list if the Phillies ever move their spring training home here (not likely). Lindsay, you just made me re-read this post to make sure that he did not boo Phil Collins. I’d like the last minute of my life back.